Drawing and Painting has always been a passion of mine from the time I was old enough to enjoy manipulating crayons, pencil crayons and finely sharpened pencils! Growing up in London Ontario I have fond memories of attending Art Classes at the London Public Library and Art Museum on Saturday mornings. Living in the rural area of Lakeside in Oxford County for more than 30 years has provided me with many opportunities and inspirations to create artistically. Family life with children and pets also has been rendered into portraits of memories. Many of my Pen & Ink images have captured woodlot wildflowers and stone farmhouses throughout the changing seasons. Currently living in Thamesford the beauty of small town atmosphere surrounds and inspires me. My commissioned Pen & Inks drawings are often enhanced with water colour. I also find Graphite or Pencil a wonderful medium for rendering textures with light and shadow in portraits of people and pets. An appreciation for fine detail is displayed within all my realism styles. My artworks are in homes across Canada, United States and Europe. I am a member of Artists of Oxford and the Ingersoll Creative Arts Centre. Visit my studio during the annual Oxford County Artist’s Studio Tour – on the first Saturday and Sunday of May. 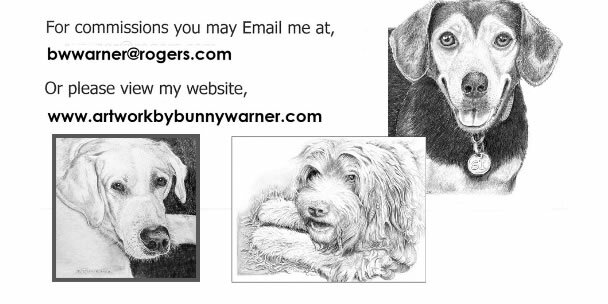 Consider giving an original, yet affordable piece of art, as a gift that will remain forever priceless within the heart of a special pet owner. Currently I am enjoying the art of photo restoration. If you have any questions or have a photo that needs a bit of tender artistic care to bring it back to ‘life’ contact me thought my email.